Expecting last-minute guests? Here is a cheap yet yummy dessert I share which you can serve to refresh them. Just add a can of milk and you’re set. My daughter loves them, whatever flavor I serve, so I’m sure your kids will too! One sachet of gulaman powder mix creates a large jar of jelly juice. That’s great for kiddie parties with numerous visitors. But when you only have few comers, you may want to add another variant in your desserts. 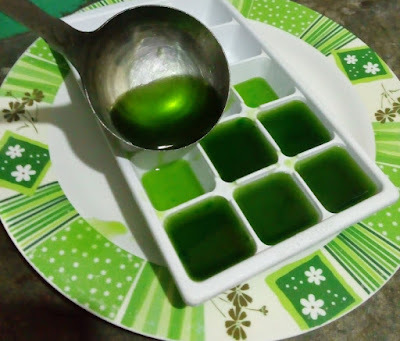 Aside from the gulaman jelly juice, serve homemade jellyace. 1. Boil water and gradually put in the jelly powder mix with constant stirring to avoid lumping. 2. When the mixture thickens, let it stay under room temperature. 3. Get your desired moulders. I got whatever is around my kitchen – ice cube tray and egg tray. Perfect shape for jellyace, right? 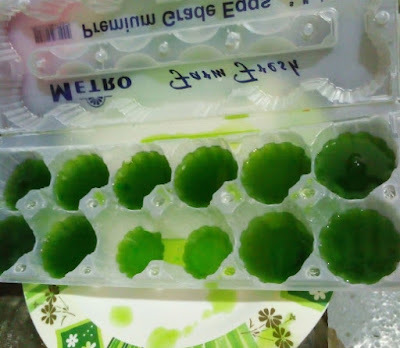 You now have your own jelly bites – homemade jellyace! Experiment with other shapes too out of containers found in your own kitchen.